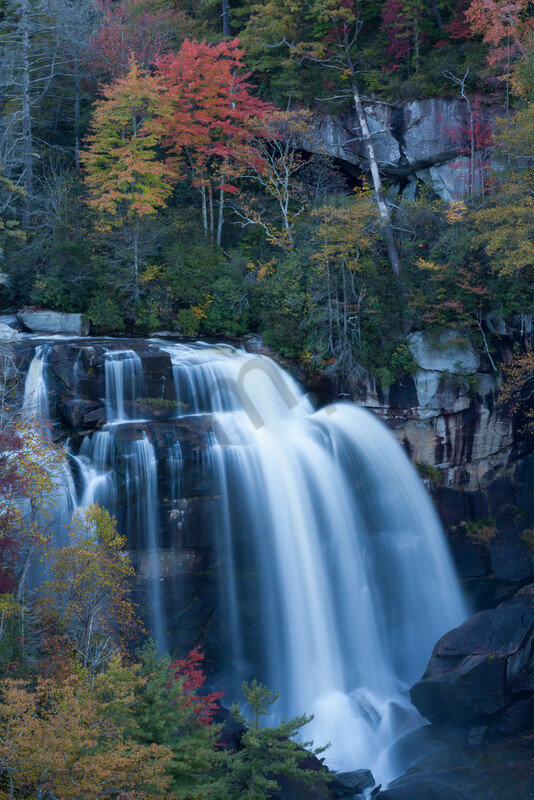 A fine art print of "Autumn at Whitewater Falls" will capture plenty of attention in your social room or dining room. It also makes a great piece for the breakfast nook, where you can enjoy a snack at the water's edge. The strong, flowing curves are handsomely framed between a pair of sugar maples and a large boulder below. Which raises the question - is it better to share a place like this, or keep it to yourself? Whitewater Falls is the highest waterfall east of the Rocky Mountains. The Upper Falls in Lake Toxaway, North Carolina tumbles 411 feet into the Whitewater River below. The magnitude of this waterfall is best experienced from a small viewing platform inside the gorge, nestled against the canyon wall, at the bottom of 150 winding wooden steps. The river echoes from the deep canyon floor, while the forest stretches overhead. At this point the waterfall is at eye level, where the boulders, forest and raging river work together to create a masterpiece. "Autumn at Whitewater Falls" is part of my Waterfall Wall Art series, offering a beautiful balance of water, stone and fall color. The soft lines of the waterfall contrast nicely against the angular stones and the leafy foliage of the forest. Best displayed on metal, the rich colors and bold patterns captivate the imagination. Each metal print is ready to hang without a frame, providing a bold, modern look. For a softer, more pastel appearance, choose a canvas print. Two museum-quality fine art papers are also available, should you prefer a more traditional look.